Many small-to-medium sized businesses have the tendency to believe they can’t compete with their industry’s Goliat’s when it comes to organic search. While large companies do tend to have more resources, web marketing is a vast landscape. Even Fortune 500 companies, like Starbucks, have additional opportunities to optimize their website and improve the overall user experience, increase conversions and boost search performance. 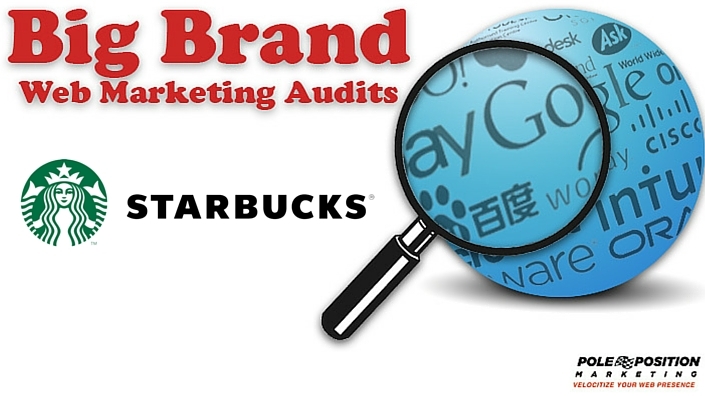 I chose Starbucks for this audit because they’ve successfully built international brand recognition, to the extent that “Starbucks” is practically synonymous with coffee. Even still, as you’ll see, they have an imperfect campaign. The areas in which Starbucks is lacking are the areas where other, smaller companies can take advantage and grow their online presence, with the real possibility of overcoming “the giant” and gaining a competitive advantage online. The only way to close the gap is to act, so grab your slingshot! In this site audit, I’ve identified specific areas that are integral to improving SEO performance. They include on-page optimization, broken links, redirects and site architecture. I’ll give examples of both Starbucks’ strengths and opportunities in these areas. *Side note: In conducting this audit I had some limitations because I don’t have access to Starbucks’ site in Google Analytics, Search Console or similar tools useful for gathering deeper insights. In-depth keyword research is a foundational part of search engine optimization. It will determine your core terms in addition to more granular, next-level, long-tail keyword phrases worth targeting. This, in turn will help focus your efforts and guide the optimization process. In reviewing the on-page elements, I found opportunities for improving each area listed above. By further optimizing each element, they would likely notice a significant boost in search performance. Their keyword research will reveal phrases that searchers are using to get to the site, as well as what terms are bringing traffic to specific products and services. These keywords will be used in on-page elements, but can also offer content ideas for the site. I’ll address each element individually. All of their title tags are branded, which is likely set-up by default. This is a good thing because Starbucks’ highly recognizable brand is a traffic generator by itself. However, having “Starbucks Coffee Company” in all title tags forces more than 60 percent of their title tags over the recommended 55 character limit, which results in those titles being cut-off in the search results. Reworking their title tags to incorporate the brand name and keywords while staying at or under 55 characters is necessary in this scenario. Ultimately, they need to make the most of the prime title tag real estate by creating compelling titles that will entice visitors to click into the site. The other title tag issue I came across in this audit is that of duplicate title tags. In most cases I came across, this is happening because the content management system and online shopping system allow multiple URLs to be created for the same content via session IDs or other URL parameters. For instance, the following URLs will lead to the same content: http://www.starbucks.com/blog/a-family-favorite and http://www.starbucks.com/blog/a-family-favorite/516. One of the URLs above should be chosen as the canonical URL (I’d recommend using, http://www.starbucks.com/blog/a-family-favorite) and canonical tags should be implemented on both pages. Otherwise, the pages are being crawled and valued separately, causing duplicate content as well as duplicate title tags. It also results in link, social and optimization value division among all of the pages/URLs sharing the same content. Approximately 60 percent of their title tags are duplicate. I’ll cover canonical tags more in the Site Architecture section of the audit. However, for more information on how to handle other types of URL parameters, see Google’s Search Console help article on categorizing parameters using their URL parameter tool. I didn’t find any pages that were missing a title tag and overall the title tags seemed to coincide with the page URLs and content on the page. They may want to rework the title slightly if they decide to remove the branded part of the title tags. Aside from that, this title does a good job of representing the content a user will find on the page if they click through. Like with title tags, meta descriptions have an optimal character length. When a description exceeds that length, it will get cut off in the search results. The number of long descriptions is fewer than the number of long title tags as roughly only seven percent of Starbucks’ meta descriptions are over 150 characters. In some cases, it appears as though the long descriptions are a result of the meta description not being specified. If a page isn’t assigned a custom description in the code of the page, search engines scrape the page for text and present what they deem relevant in the search results. An estimated 67 percent of their pages are void of a meta description. Only in circumstances where a page is targeting many long-tail phrases is it sometimes wiser to let search engines obtain the text they presume to be most important. About 12 percent of their pages have duplicate meta descriptions. The cause of the duplicates here is the same as the cause of the duplicate title tags — their system allows the same content to be found using multiple URLs. Once they’ve set canonical tags and used Google’s URL parameter tool, the duplicate issues should be resolved. Obviously, their blog is going to be one of the main sections of their site for content. However, most of the product pages have content as well. Product page content is typically product details, features and descriptions. Their product pages tend to stick to that framework. The pages with the least amount of text are their category and sub-category pages. It may be worth testing to see whether or not having more content on those pages would positively or negatively affect their various web marketing goals. Maybe they’ve already tested this and have determined that users can find the information they need from the specific product pages. Often times however, category pages can be good candidates for longer-tail keyword phrases. The content on those pages can also help users get to the right product page if they don’t already know the specific product they’re looking for, which should be a major consideration when determining whether or not to add text to those pages. For instance, a shopper not familiar with Starbucks’ coffee lineup may not know they have coffee roasts ranging from dark to blonde, with medium in between. Adding a few sentences of text could help a novice Starbucks’ drinker navigate to a product page specific to their palate. In the image below, you’ll see where I suggest placing content. The header image is taking up a good bit of space at the top of the page, so they may need to consider re-sizing it and/or rearranging other elements on the page to make room for the text. They’ll want to make sure the text doesn’t push the products below the fold of the page. Any text that’s part of an image can’t be read by search engines, with the exception of the alt image tag, so they won’t want to add the text there. Heading tags range in hierarchy from H1 to H6. H1 tags are the most important, and each page should only have one H1 – with few exceptions. H2, H3 and H4 tags can be used in content areas of the page to help break up the text into scannable parts. H5 and H6 tags can be used by developers to segment areas of the site, if needed. Some developers using HTML5 may nest H1 tags in section elements. However, this doesn’t provide meaningful document structure. Starbucks’ homepage is an example of this. It’s best to use H1-H6 heading elements to express structure. The H1 tag should be keyword optimized to aid in both search ranking performance and user experience. All other heading tags (H2-H6) should be used for sub-headings and should integrate keywords when relevant. Every image on the site should have an alt tag. There are 179 images currently on their site that don’t have an alt tag. By adding alt tags, they can display alternate text to search engines and visitors when the image isn’t available. It can also help their search rankings and drive traffic to their site by classifying the images for search engines to use in order to help people find the images they’re looking for. Many of the images missing alt tags are on their blog. When search engines crawl a site to index pages, one of the things they factor in to the overall evaluation of the site is how easy it is for their crawlers to navigate. When the crawlers encounter certain issues, such as broken links, unnecessary redirects, duplicate content and other performance-killing factors, it disrupts and slows down their ability to crawl the site. This in turn affects visitors’ experience and the site’s performance in search. Implementing proper fixes for these and other barriers paves the way for a better functioning website. When a site has a lot of broken links, that can deter the search engines from crawling it altogether. Furthermore, broken links impede the proper flow of link value throughout the site from page-to-page and is a hindrance to a positive user experience. The “linked from” page (http://www.starbucks.com/blog/bumber-ella-ella-ella-shoot/588) contains a link to http://sched.bumbershoot.org/venue/Starbucks+Stage. If you try to navigate to that page, you’ll notice the URL is broken and results in a 404 error. Starbucks should change the linking URL to a URL that isn’t broken. If they can’t find a page on the website with content similar to the page they originally linked to, they should eliminate the link. They have a total of 1,774 broken links. The purpose of a redirect is to forward one URL to a different URL. There are different types of redirects. The most common, and often the best type of redirect for SEO, is the 301 redirect. A 301 redirect is a permanent redirect that passes up to 99% of link value to the redirected link. Redirects aren’t bad, but because some SEO value is lost in a redirect, it’s best to avoid having them whenever possible. Redirected links should be updated to avoid the redirection, if possible. The “linked from” page (http://www.starbucks.com/responsibility/learn-more/relationships) contains a link to http://new.usgbc.org/. That URL is redirecting to the “redirected to” URL (http://www.usgbc.org/) on the next line. They’ll want to change the linking URL on the linked from page to match the redirected to URL. This will eliminate the link from having to do a redirect. The best way for them to avoid duplicate content is to manage their URLs so that each URL displays different content. Each URL parameter should allow for unique content to be displayed. If possible, they should avoid using session IDs to track visitor usage on their web pages. This causes multiple URLs to display the same content, and leaves it to search engines to determine whether the content is duplicate or not. As I mentioned earlier, when a search engine finds multiple URLs, they split the link, social and optimization value between the different URLs. There are better ways to track visitors, so I suggest using those instead. It doesn’t appear as though canonical tags are currently being used on the site. They need to utilize canonical tags on each page of the website. If this tag isn’t set in place, indexing signals could get diluted and crawler capacity may be lost. It’s best they manage their URLs in order to avoid duplicate content altogether, but the canonical tag acts as a good reinforcement. This SEO Site Audit covers many major areas for consideration both from a user standpoint and from the perspective of improving search rankings. Taking advantage of the opportunities presented in this audit will result in a more fully optimized site. This, however, should not be seen as an exhaustive list. There are many additional factors that contribute to a website functioning optimally on all levels. Once Starbucks’ makes adjustments in these areas, they may want to dive into other tools to gather insights and find additional opportunities. Annalisa specializes in SEO at Pole Position Marketing. Annalisa enjoys cycling, running and most other participatory sports. She is also a craft beer and coffee zealot. She resides in North Canton, Ohio but Pittsburgh, PA will always be her home. Read Annalisa’s full bio.